Wondering how to decorate a cupcake tower? It's easy, fun, and can be as intricate or simple as you like. A cupcake tower, sometimes called a cupcake tree or cupcake stand, is an elegant and beautiful way to display a collection of cupcakes for a celebration or special event. 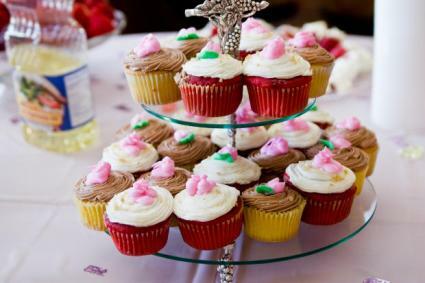 Before you begin creating and decorating your cupcake tower, think about design ideas and ask yourself a few questions. What's the occasion for which you'll be making the cupcake tower? Does it call for something svelte, basic, or whimsical? Do you want easy decorations that you can do quickly or more extensive details that will take longer? You might also consider how to decorate the cupcakes in the tower. Their color scheme and overall appearance may influence how you would like the tree to appear. Most cupcake towers are simply a series of stacked platforms, each of which can hold a varying number of cupcakes depending on its size. Some cupcake towers have plastic or cardboard platforms, and others are sturdier and have glass or stainless steel platforms. Some are made from cake tiers. 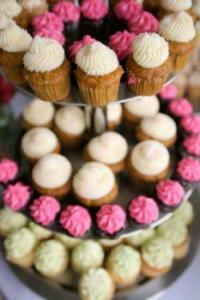 Many cupcake stands are on the market, from the most basic models to handcrafted styles to custom-made designs. If you enjoy craft projects, you may want to order a basic cupcake tower and decorate it yourself to fit a theme or special occasion. If you're an experienced cake decorator, you may want to spend some extra time crafting a custom cupcake tower or intricately decorating the cupcakes on a simple tower so that your design really stands out. Decorate a series of regular-sized cupcakes with colorful frosting, and accent with fondant designs. Set the cupcakes on each level of a multi-level cupcake stand, leaving only the top level empty. Bake, cool, and frost a giant cupcake (baked in a big cupcake pan or tall cake pan) on top of the cupcake tower, and decorate it with matching or contrasting colors. 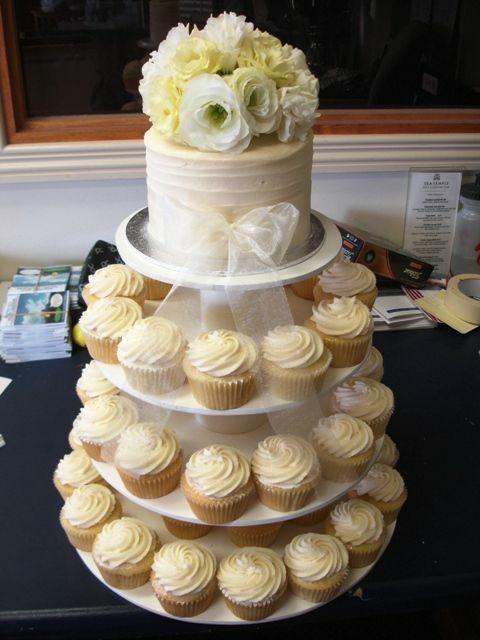 A look that is especially elegant for a wedding is a cupcake tower topped with a small wedding cake. If an engaged couple wants both a cake and cupcakes at their wedding, this design is a good way to blend the two. It's also possible to top the stand with a double- or even a triple-layer cake. For a spring occasion or a bright look, try decorating a cupcake tower with a flower theme. Plain white frosting, either buttercream or fondant, will work best in making the colors of the flowers pop. If you want edible flowers, form them from fondant with flower cutters or shape them by hand using gum paste. You can also purchase pre-made edible flowers from some cake-decorating or specialty-baking stores. Pastel colors work well for springtime, but you may want brighter, richer colors for a birthday or another celebration. You can get the deepest, most natural colors by using real flowers. Top each cupcake with a single flower, and place a single-layer cake frosted with white buttercream on top of the cupcake tower. Arrange a spray of flowers on top of the cake in a pile or pattern. Another idea for how to decorate a cupcake tower is to build custom-made toppers for your tiny cakes. This can be done with toothpicks and printed paper or specialty handmade designs that are attached to craft sticks. If you're a beginner at cake decorating, making cupcake toppers may be the best choice for you because you can decorate your cupcakes very simply and top them with something more unique.